The colorful and picturesque cover of Ojai’s Table hides more than a simple collection of recipes. Flip through the pages and you’ll soon discover the magic of this rural Southern California village that has – for more than a century – been a magnet for educators, artists, spiritualists and farmers. Through colorful essays, informative head notes, enlightening sidebars and illuminating quotes the author pays homage to a wonderful hamlet that is situated in a glorious east-west valley. It is a beautiful celebration of the people who inhabit the Ojai Valley and the crops that come to her tables. But don’t let the stories totally distract you. First and foremost, Ojai’s Table is a cookbook. There are more than 125 original recipes each featuring locally grown Mediterranean ingredients like avocados, citrus, olive oil, walnuts, persimmons, lavender, tomatoes, pomegranates, zucchini … all the desirable and necessary makings for a healthy Mediterranean diet. And be on the lookout for some unexpected uses for those ingredients. Have you tried Avocado Chocolate Pudding recently? Rich, smooth, creamy, healthy and delicious, you’ll find it in the recipe section of this website. So if you are a cook or a gardener or if you dream of being a cook or gardener, pick up a copy of Ojai’s Table, find a comfy chair and enjoy a rich collection of recipes, the intriguing snippets of Southern California history, the generous splashes of local color and the first-hand stories about farming life. 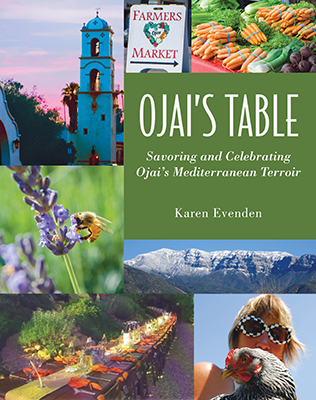 This book is an entertaining tribute to Ojai’s natural beauty, Mediterranean terroir, artisanal foods and community spirit. Karen Evenden, the author of the best-selling travel memoir and cookbook, A Taste of Croatia was born and raised in Buffalo NY and has a BS from Cornell’s School of Human Ecology and an MPA from the University of Washington. She has lived landside in Detroit MI, NYC, Versailles KY, Sydney Australia, Seattle WA and Ojai CA. She also spent more than 6 years living aboard a sailboat in the Mediterranean where she wandered the markets and prepared the foods of France, Italy, Greece, Turkey and Croatia. In Seattle she owned a kitchen store and cooking school. In search of sunshine, she and her husband moved to Ojai CA where they became farmers – growing Ojai Pixie Tangerines, lavender, olives for oil and walnuts. These sweet and savory morsels are always a hit. Prepare them with dates purchased at the Ojai Farmers’ Market, sweet and crunchy Ojai walnuts and bacon from Westridge Market and you’ll have a genuine Ojai appetizer. Preheat the oven to 400 degrees and line a large rimmed baking sheet with aluminum foil. Make a lengthwise slit in each date and stuff the date with a walnut half. Cut each slice of bacon in half and wrap a piece of bacon around each stuffed date. Place the wrapped date on the baking sheet making sure that the tail end of the bacon is facing down. Bake until the bacon is crisp, 25-30 minutes. Using tongs, remove the dates from the baking sheet and onto a paper towel to drain. Transfer to a serving platter and serve. • If you’re using thick-sliced bacon, you may need to bake an additional 5 minutes. • Dates can be assembled in advance and refrigerated or frozen until ready to use. Baking times may need to be increased. The colorful combination of crisp and soft textures and autumn’s favorite flavors will surely put this hearty salad on your post-summer menus. Save the leftovers for the next day or even the next couple of days. The flavor just gets better. Preheat the oven to 375 degrees. Cover a large rimmed baking sheet with foil and spray with nonstick spray. In a large bowl, mix together 2 tablespoons vegetable oil, cumin, sesame oil and ½ teaspoon salt. Add the sweet potatoes and toss to coat. Spread the sweet potatoes in a single layer on the baking sheet and roast until the sweet potatoes are tender and lightly browned on some edges, about 45 minutes to 1 hour. Cool to room temperature. In a small bowl whisk together the cider vinegar, curry powder, honey, Dijon mustard, ½ cup vegetable oil, salt and pepper and set aside. In a large bowl, combine the apples, grapes and cranberries. Add the sweet potatoes and any juices that have accumulated on the baking sheet. Add the prepared vinaigrette and toss gently. Refrigerate until ready to use. Sprinkle with almonds and serve. Best served at room temperature. • This salad is hearty and tasty enough to serve as a vegetarian entrée.